I want to apologize for not being able to visit and comment on your blogs nowadays. I’m so uber busy talaga. I have not even answered some of your comments yet. So what’s keeping me busy? We’re busy repainting the house and preparing for Sean’s 4th birthday on Friday. We’re also out of the house most of the time…. lakwatsa galore, nagpapalamig sa mall. Kaya pag umuuwi, exhausted na wala ng time mag online. Buti nga natapos na graduation ni Sean kaya bawas sa pinagkakabusy-han ko. Pasensya na Jessie if I have not updated the blog seanfranciskeith.com I won from your contest last year. 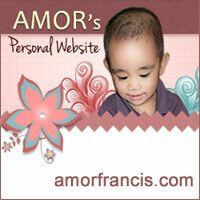 I already designed the template last month pero since dumating si hubby first week ng March, busy-busyhan na lalo. Kaya ayun, nasa Photoshop pa rin hindi ko pa naco-convert sa WordPress. Hopefully kapag natapos pinagkaka-abalahan ko ngayon, uunahin ko yun. Sorry but the link to seanfranciskeith.com is not working. It will be superb. when it will come alive amor? Thanks for bringing that to my attention Shanker. When it will come alive? I don’t know, I can’t give exact date yet, but I will post about it here one of these days.